Winter Traveler Game: Some of us love spring, some enjoy the summer breeze, others are falling in love with autumn and all its beauty. But even though it’s cold, some of us love winter. There are people who enjoy the cold weather, enjoy the snow and the white surrounding, adore spending time on the mountains and that is when they feel perfect. Our character of the day is actually that kind. Nancy is the winter-loving girl and we are sure you would love to accompany her in this loving habit. Maybe Nancy will give you a new perspective, maybe summer is not going to be your unique favorite season. Nancy adores the winter, she uses each occasion to walk outside, to go outside and enjoy the nature, even when everything is frozen. Nancy also loves riddles, so today she prepared few riddles for our player. Our player should answer all the questions if he or she wants to go for the winter walk. Let’s go to the mountains and enjoy the silence and the beauty of nature. Very often we forget that we are part of it. 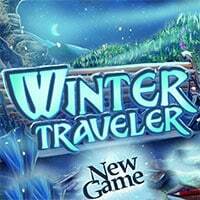 Enjoy playing Winter Traveler Game! Make sure to check out The Cursed Prairie, Earth Cracks, Forgotten Tombs, Lost in Neverland and The Accursed Island Game. We picked up these games for you from our hidden object games. So have fun.